The B&B Pomarancio fits perfectly into its prestigious context, still intact and authentic, yet unknown to most visitors: the Montefeltro region. 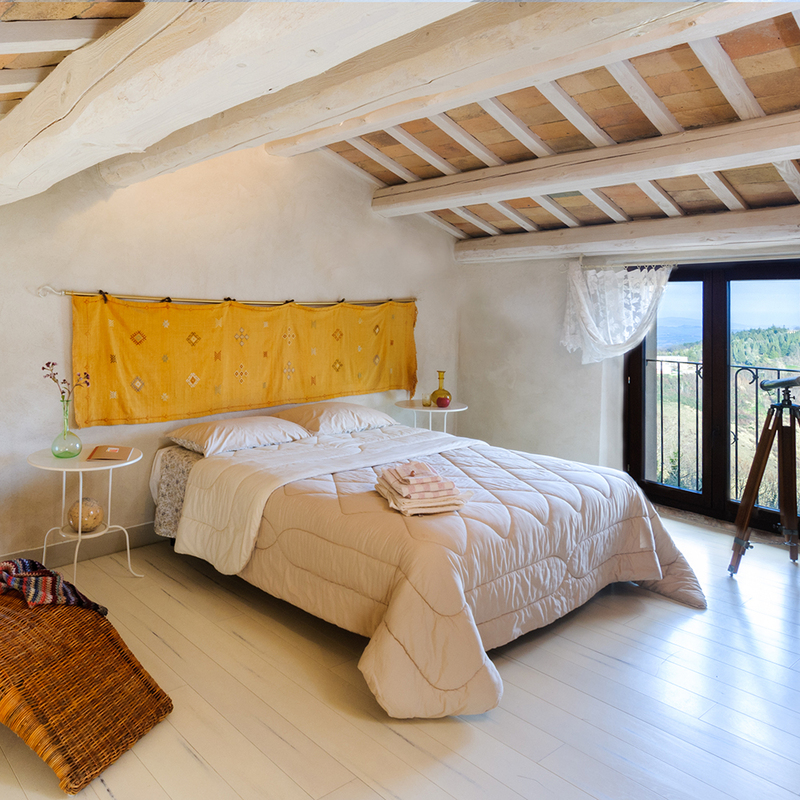 Our B&B is a historic home that was recently renovated by recuperating its warm and welcoming original materials: the wooden beams are once again visible to the eye, as well as the handmade cotto tile floors and the original staircase from the 17th century. We furnished the Pomarancio to fit our taste, the place has remained unchanged, yet we have reconciled it with comfort and refinement. Every room is equipped with a private bathroom, autonomous heating, a minibar, Bellora linens, complimentary Wi-Fi, antique furniture and objects of art. The name of each room is meant to introduce the guests to our territory and its distinguished personalities and historical events. Each room has a different view: in the east overlooking the sea, and in the west, the Nerone Mountains and the town of Carpegna. 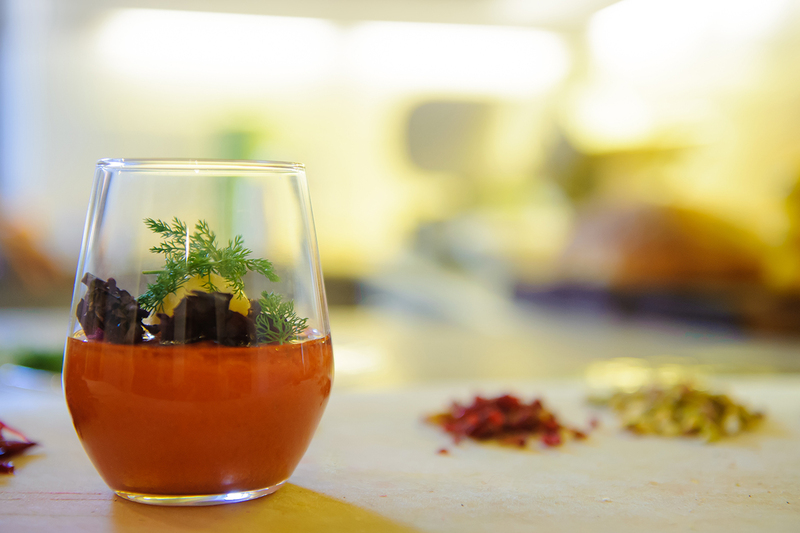 When you arrive here at Pomarancio, in the Medieval village of Mondaino, you will be welcomed with a taste of our local cuisine and a glass of select wine, to be tasted in your room, or in the ancient sandstone grotto. For breakfast, we offer food of our own production: a sourdough starter allows us to bake homemade focaccia bread, regular bread, cakes and cookies. We also use strictly local, fresh and free-range eggs. The countryside around Mondaino and the Bed & Breakfast Pomarancio bears ancient and forgotten high quality fruit, which we use to make our jams, with labels hand painted by a refined watercolorist. Honey and ricotta cheese from the nearby farmers and savory breakfasts will satisfy all tastes. Please join us in the heart of the medieval town of Mondaino, with a sojourn in a Bed & Breakfast that is rich with possibilities: you will have easy access to the sea, to Art heritage cities, long walks and cycle tourism. We are close to Urbino, Rimini, Pesaro, the small Republic of San Marino and the spectacular town of San Leo, as well as Gradara and Cattolica. Recently, many itineraries have been traced between Mondaino, Saludecio, Montegridolfo and the Valley del Conca. We provide a small guide with a detailed map and a packed lunch. In Montefeltro, just a few kilometers away, you can enjoy the sea, mountains and hills, for a varied and never monotonous visit, in both summer and winter. In small enterprises such as our own, true hospitality and a cordial reception are found in the little things, as in all timeless places. The Paolo and Francesca room is a comfortable and bright master bedroom facing East. The details in the room’s furniture give it a romantic atmosphere: the headboard of the bed is in wrought-iron; the bed is wrapped in a soft mosquito net; on the right hand side of the window, a small nook recovered during our last renovation, holds the statue of a small Venus. Next to the bed, a wooden wardrobe from the late 19th century is engraved with figures bearing gifts from the sea on one side, and from the harvest on the other. It was the engraver’s intention to celebrate the beauty of this territory. The clothing rod with hangers is secured to the ceiling beams by small chains; it functions as a closet while also maintaining the sense of ample space that the room provides. The bathroom is private and the heating autonomous; you will find a mini bar, many books to read, and complimentary Wi-Fi to cater to all your needs. The Bellora linens and hand-embroidered curtain offer a taste of the rare and beautiful things that characterize our territory. The room is cleaned every day. The Paolo and Francesca room is ideal for those who want to treat themselves to a private and romantic holiday near Rimini. 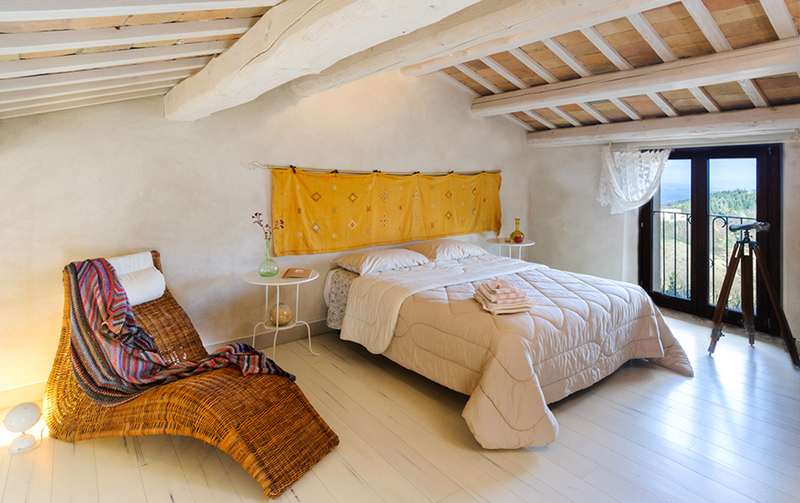 The master bedroom Della Rovere is a spacious, refined and elegant space on the first floor of the B&B Pomarancio. The queen-sized bed has a headboard in wrought iron, behind which there is an antique beam with a small nook, discovered during recent renovations. The built-in wardrobe has an original engraved cherry-wood door, much like the main door of the room. Next to the bed, an adorned retractable record player from the 1950s functions as a nightstand. In the center of the room, a wrought iron garden table from the 1940s tones down the general elegance of the space, making it more cheerful and informal. The floors are covered with handmade cotto tiles, whereas the beams on the ceiling alternate between the original darker beams and the new ones, in light colored wood, which give a touch of bright modernity to the space. An attention to detail can be also seen in the embroidery of our linens, both in the room and private bathroom, which is also equipped with a hairdryer and organic soaps. The room is cleaned every day. Each morning you will be greeted with small samples of seasonal fruit and tasty snacks in the mini bar or on the table. The Della Rovere room is perfect for those who want to treat themselves to an elegant and refined stay, in all its variations. Light, spaciousness and refined comfort permeate this room. The sleeping quarters consist in a spacious loft with a parquet and ceiling beams in white wood. An exotic taste is given by the ocher colored Kilim silk headboard, the sloping ceiling that frames the beautiful wardrobe from the late 19th century, and the garden chaise longue and telescope by the window overlooking the hills and sea. A floral hand embroidered curtain filters the light, making it suffused and evocative. On the main floor, a desk and rocking chair from the 1940s are perfect for reading, we also offer complimentary Wi-Fi. You will be welcomed with homemade sweet and savory snacks, seasonal fruit from the local orchards, and a selection of tea or a glass of wine chosen amongst the many vine growers in the area. You will find Bellora linens in the bedroom and linen and embroidered decorations in the private bathroom. The room is cleaned every day. We will be happy to offer room service for breakfast: sweet and savory finger food, fruit picked from our trees, honey and cheeses, as well as unusual jams to be tasted on our homemade bread.